Back in 2014, Ardis Kyker was at home going about her daily routine when she experienced tightening in her chest. The pain went away as soon as she sat down to rest, so she proceeded with her day. Later, while pushing a cart at a grocery store, the pain returned with more intensity. So Ardis checked in at the Emergency Department at Mayo Clinic Health System in Red Wing, Minnesota. While test results ruled out a heart attack, the team in the Emergency Department scheduled her for a stress test because of the pain she was feeling on exertion. The stress test explained the chest pain. Ardis had a blocked artery. To learn the extent of the blockage, she was scheduled for a cardiac catheterization at Mayo Clinic in Rochester. That test revealed that the artery was 99 percent blocked and needed immediate attention. So Ardis received a coronary artery stent and was encouraged to enroll in a cardiac rehabilitation program. 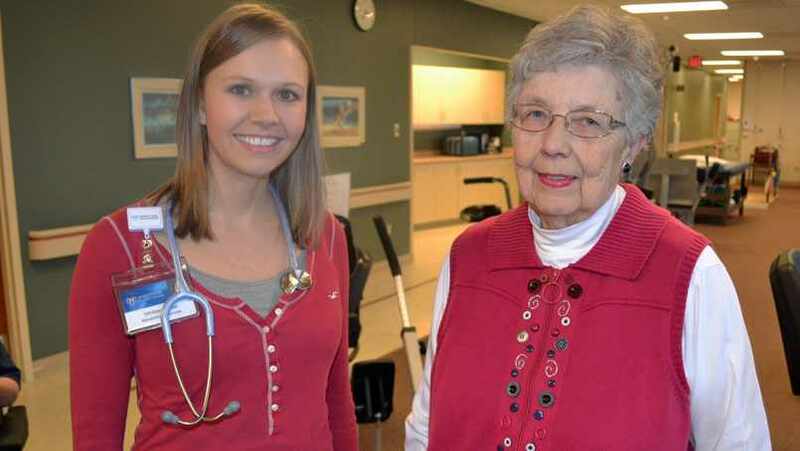 In August 2014, Ardis attended the first of 36 cardiac rehabilitation sessions with Whitney Quast, a cardiac rehabilitation therapist in Red Wing. During her first appointment, Quast assessed Ardis by having her walk the halls in the rehabilitation gym. At that time, Quast says, "She walked for a total of six minutes at a slow pace. Our goal over the 12-week period is for all patients to increase their pace, distance and endurance." Over the next 12 weeks, Ardis met with Quast three times a week. During the rehabilitation sessions, she did calisthenics, strength training and worked out on the treadmill, the arm ergometer, and the recumbent stepper, which Ardis refers to as "The Beast." According to Quast, Ardis' dedication to the program paid off. She doubled her fitness level by the end of the program, based on calculations from the walk test and the exercise machines. After graduating from the program, Ardis registered for the Wellness Program led by Quast, which is an extension of the Cardiac Rehabilitation Program. "Since starting with Whitney in August, I have lost enough weight to need a new wardrobe, and have lowered my blood pressure and heart rate," Ardis says. "Whitney has given me the knowledge I need to live a healthier life by watching what I eat and by exercising on a regular basis." Learn the signs and symptoms of coronary artery disease. Explore the Cardiac Rehabilitation Program.